Impacts of climate change combined with increasing water demand, increasing urbanisation and harbour facilities will reduce the amount of fresh water in the coastal plain, and will influence the fresh-salt water distribution. Because of insufficient drainage, floodings can arise during periods of high rainfall, which can also increase the groundwater recharge to the aquifer. In addition, floodings with sea water inundates can influence parts of the dune and polder area, causing salt water to enter the aquifer. The fresh water resources of the project area Zeeland are at present jeopardized by various causes. Floods, droughts, land subsidence, eutrophication and salinisation of the ground and surface waters are some pressing topics. In addition, sea level rise threaten the coastal groundwater system as well as flooding protection infrastructure like embankments. All these processes combined with climate change contribute to the salinisation of groundwater and surface water in Zeeland. Sustainability issues of agricultural activities and nature conservation call for detailed information regarding the distribution of saline – brackish – fresh groundwater. For well balanced groundwater conditions the depth of the freshwater/saltwater interface can be estimated approximately. Storm tides with flooding of saltwater to the dune area in the groundwater recharge area endanger the freshwater aquifer by infiltration of saline water, which happened in the winter 2006/2007 where storm surges caused heavy damages to the Frisian Islands. As a consequence of climatic change the time pattern and the intensity of precipitation is expected to change - with dryer summers and more rainfall in the winter season. This can lead to increased groundwater recharge and to a rising groundwater table in some areas either close to the sea or where increased precipitation causes increased groundwater levels. Landfills without leachate collection system (e.g. 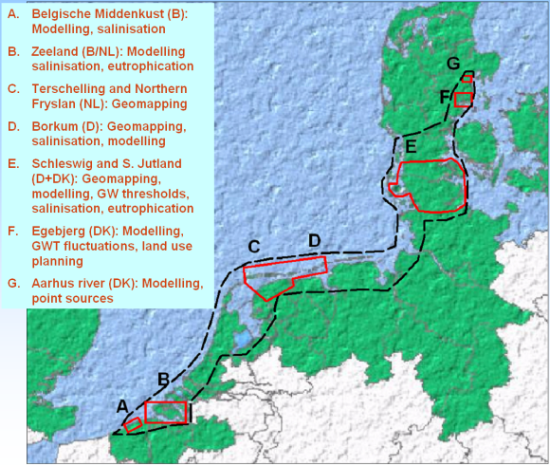 Hørløkke) provides risks to future groundwater quality due to changes in groundwater level. Climate changes will affect the delineated industrial and agricultural development areas due to flooding. Rise in groundwater and sea levels will challenge the construction business and it will be necessary to come up with new standards. It will also change the available groundwater resource and pattern of stream flow including seasonal variation in river runoff. Leaching from a number of polluted sites will increase. The groundwater fluctuation will become more extreme resulting in regular yearly risks of leaching due to the physical and chemical environment. The winter situation will probably cause increased risk of leaching of contaminants. This will increase the risk of outwash of chemically components from the site to groundwater, coastal areas and streams. How the waste sites will be affected is not presently well understood.